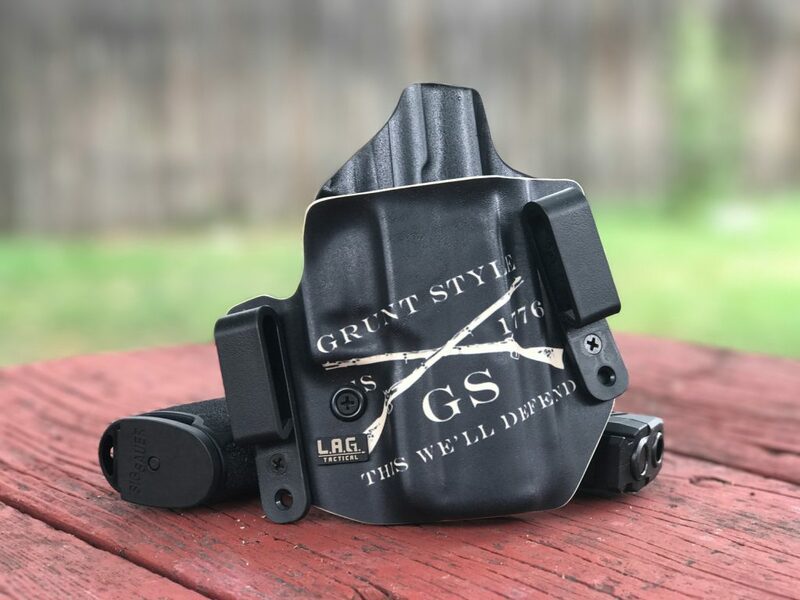 For the past several weeks I had the opportunity to have an exclusive look at and review the new Grunt Style Defender Series Holster made by L.A.G. Tactical. I met up with their company founder Evan Prive-Shereck at the NRA Show earlier this year, and he told me about this special collaboration with the ever popular brand, Grunt Style. If you’re not already familiar with the Defender Series holsters from L.A.G. Tactical, you’re missing out. 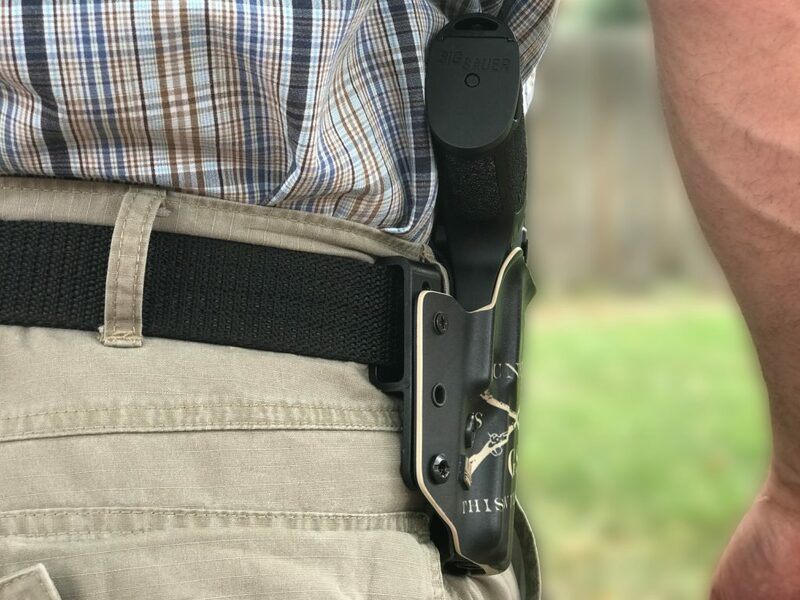 It seems like it’s becoming a thing for holster manufacturers to make holsters that can serve multiple purposes and be worn and used in different ways or positions. This company was one of the first to do this. 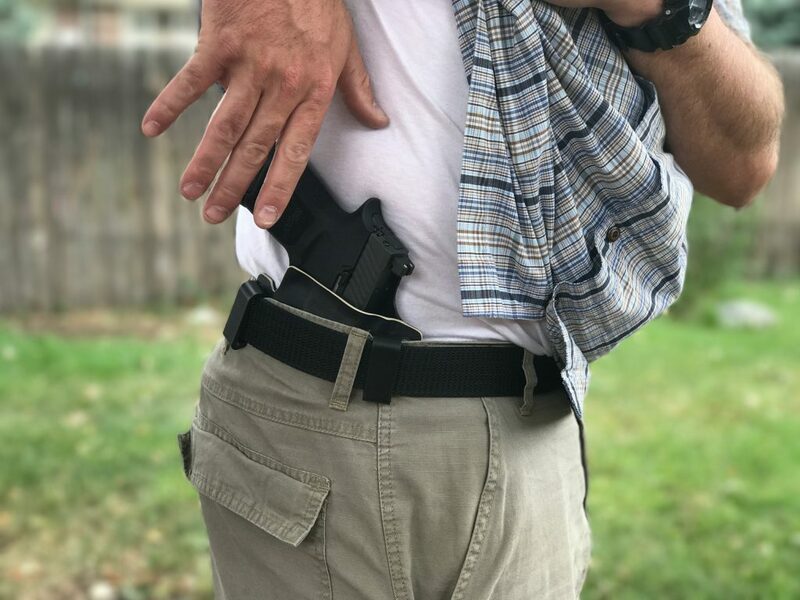 The Defender Holster is an IWB/OWB (Inside Waistband/Outside Waistband) holster that can be swapped between roles in a matter of minutes. All one must do is remove the IWB clips and replace them with the OWB loops or vice versa. Now in full disclosure, L.A.G. Tactical sponsors me as a competitive shooter. This may lead you to believe that this review will be biased, and that’s a fair point. But let me be clear that it was I that sought them for a sponsorship because I was impressed enough by their holsters and other products that I wanted to represent their brand. They were kind enough to take me on, but they didn’t have to, and I would still like their products even if they didn’t sponsor me. I have always been impressed with how well they take care of customers, with their level of quality, and also their impeccable attention to detail. I ordered my Grunt Style Defender holster to my Sig Sauer P320 Carry/Compact. The fitting of the kydex to the gun is perfect with no wasted space or slack anywhere. It is perfectly molded to the gun and I really appreciate that the mag release button is covered. I have had IWB and AIWB holsters (appendix) where the mag button was somehow pressed and my mag came loose without me realizing it for some time. As you can imagine, this is pretty scary as when the moment arises requiring quick deployment of your gun in defense of life, if your magazine is loose in the gun, you’re going to have a very rude and potentially deadly surprise when your gun only manages to fire one shot. L.A.G. Tactical makes all of their holsters easy to adjust for retention, which is something that I wish all kydex holster manufacturers would embrace. All one must do is rotate the screw located just below the trigger guard to either tighten or loosen the retention level. My Grunt Style Defender Holster arrived with the retention perfectly adjusted, at least for me. When adjusted properly it retains well with a nice, tactile “click.” But upon release the gun comes out quickly and easily. All of the screws that come with the holster, its loops, and clips have yellow thread locking compound applied. This ensures the screws will not come loose regardless of how the holster is worn or how intensely it is used. 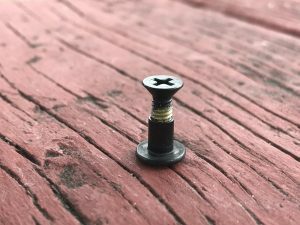 I have had screws come loose on competing holster products, and it is a great frustration with me. I shouldn’t have to worry about my holsters staying together in the hustle and bustle of life, let alone in a deadly force encounter. The rubber gaskets are truly a nice touch. 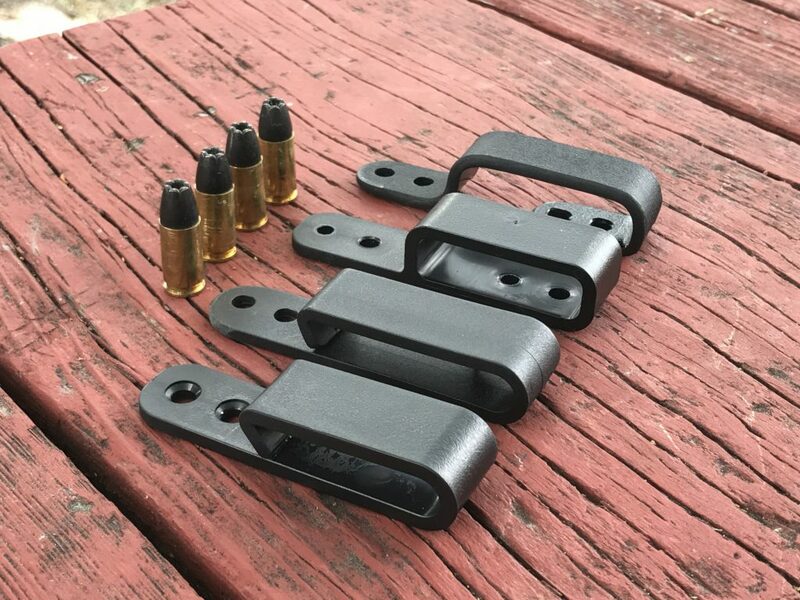 Each holster comes with plenty of the screws and associated rubber gaskets that are inserted between the clip or loop and the holster itself so that the clip/loop doesn't twist and turn unnecessarily. They also help with minimizing noise, squeaks, and rattles that some holsters have a tendency to make. Both the screws and gaskets are very small things, but they make a big difference! L.A.G. Tactical understands this, and that’s what I mean when I say that they pay attention to details. The mouth of the holster is flared to permit ease of reholstering. This flared opening is subtle enough and is placed only at the very top of the holster so as not to unnecessarily increase the size and footprint of the holster. But the flaring is sufficient enough to make reholstering easy and intuitive. This is a holster that is well-suited to the busy and varied life of the modern man or woman. Having the ability to quickly convert it between IWB and OWB roles means a person can accommodate concealed carry to a lot of different styles of dress and different activities. Carrying in the work environment where you need to ensure you’re concealed? Use the Grunt Style Defender holster in its IWB configuration, and you’re well-concealed. Wearing a jacket or heavier clothing? 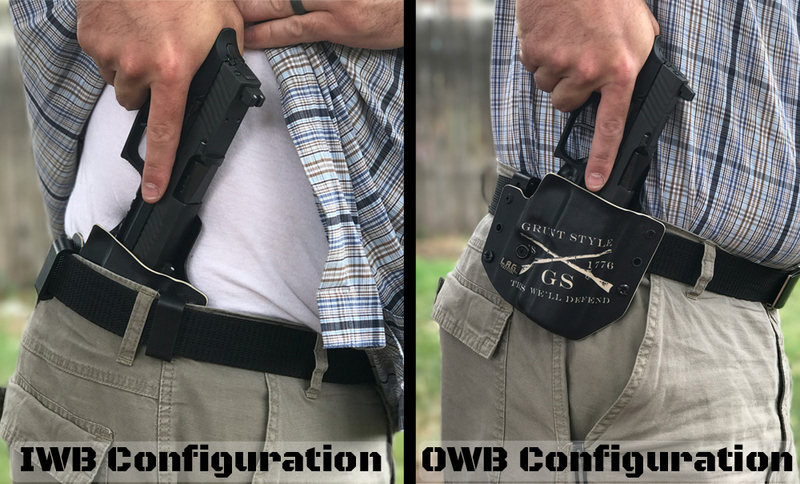 You can roll with the holster in the OWB format, and you’re good to go. Are you going through a long day of defensive pistol training where constantly going back to deep concealment isn’t practical? Using this holster as an OWB rig is perfect for the task. It carries the gun close to the body, but still permits a very confident and fast draw and presentation to the target. Using the holster in the IWB setup adjusted for maximum forward cant (my preference), I had full confidence in carrying concealed and remaining so. I asked friends and family to keep an eye for any printing. No one ever caught me while using the Grunt Style Defender holster. Even wearing the holster OWB occasionally when I was wearing a larger button shirt overtop gave me no cause for concern for concealability. The gun is kept tight to the body (an essential feature) with no discernible sag or flop. The thickness of the inner and outer portions of the kydex are different. The inner thickness measures at 0.06” and the outer thickness is 0.08”. I like the idea of a thicker kydex, but it comes at a cost. Thicker material is obviously bulkier and increases footprint slightly. Many think that a thicker kydex will be stiffer and stronger which it certainly is, but for most people a 0.06” thick kydex material will be plenty strong. This additional strength and stiffness means that a kydex holster worn inside the waistband will be less forgiving and less comfortable. 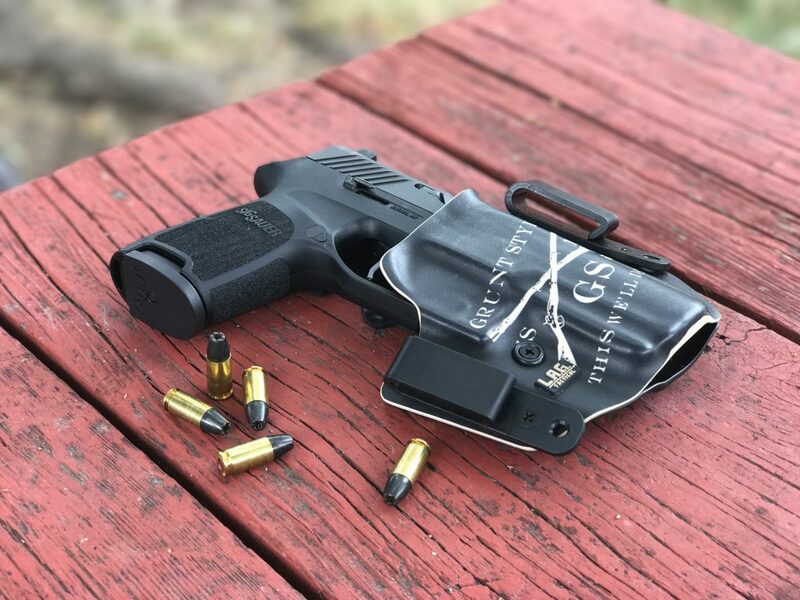 The Defender Holster compromises well on this balance between strength and forgiveness by incorporating the thinner kydex on the inside and the thicker layer on the outside of the holster. A category related directly to the materials and construction is comfort. As rating comfort of the holster while worn OWB is a non-issue, this section will focus on its comfort while worn inside the waistband. This would be probably my one major critique. Is it a comfortable IWB holster? Compared to an all-leather holster or even one made from nylon or other flexible man-made materials, it isn’t even close. I have never been a fan of all-kydex IWB holsters. If I’m going to stuff something in my waistband right at or just behind my hip bone, then I want it to conform to and contour to my body. Kydex just doesn’t do that. 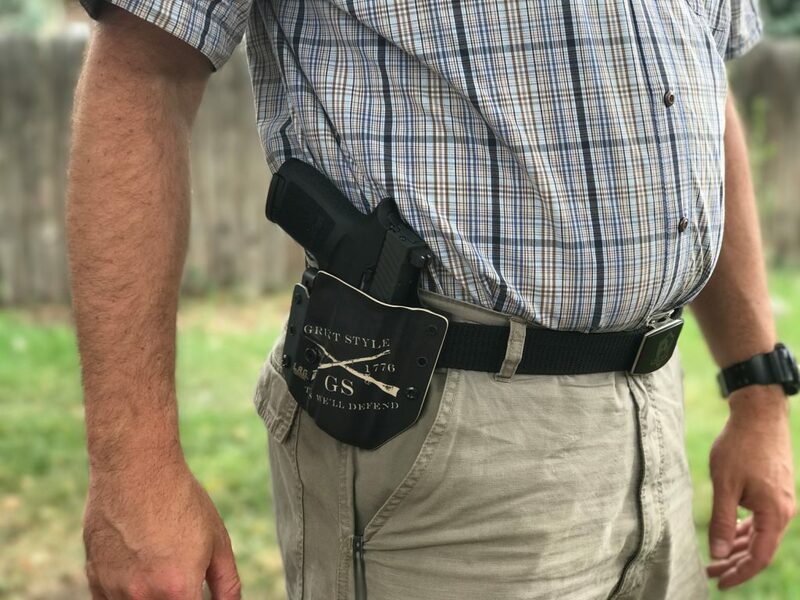 I am okay with an appendix holster being all kydex, but that’s because they occupy a much smaller footprint, usually not much bigger and wider than the gun itself. But IWB holsters (those worn in the 4:00-5:00 position) generally require more than one attachment point and thus utilize a much wider design. That said, I have worn other all-kydex holsters that were much less comfortable. I’m not sure I can put my finger on what it is about this holster that makes it more comfortable than other, competing kydex holsters. Maybe it is the shape and contour—maybe it’s just the right shape and angle to fit my body. I’ve worn this thing all day for a number of days, and it hasn’t bothered me much at all. Like I said, it is not as comfortable as a leather holster, a leather/kydex hybrid, or the Brave Response Holster. But it’s workable. While the Grunt Style Defender holster doesn’t garner too many points in the comfort department (not too surprising considering most all-kydex or all-polymer IWB holsters don’t fare well), it pretty much wins on all other factors. It also wins in the price department. 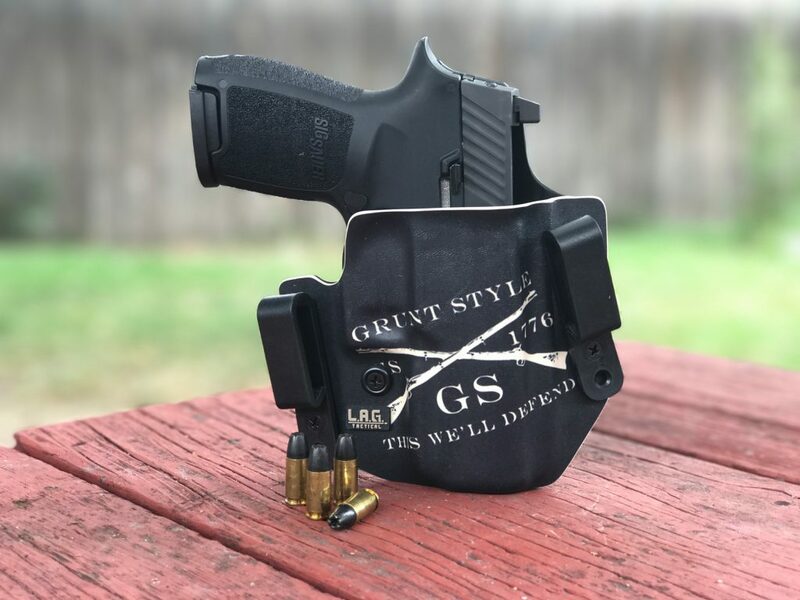 At $84.95 it is totally worth it for a holster that is extremely well-built, leaves nothing to be desired as far as quality and design is concerned, and all the little details have been taken care of. Plus it’s Grunt Style. What’s not to love?! 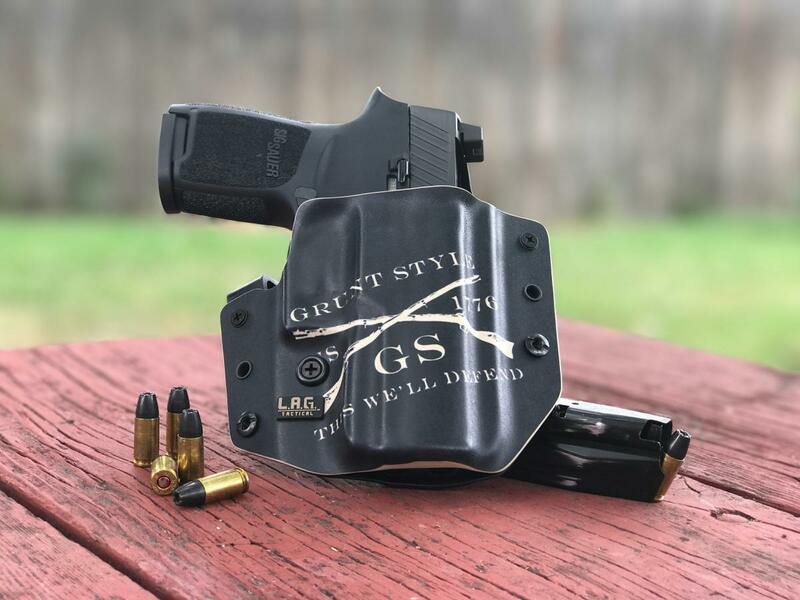 So if you’re looking for a quality, durable, stylish holster that reminds us of those things that are worth defending, check out the Grunt Style Defender holster made by L.A.G. Tactical. I think you’re going to love it, too. These are not on their web site. Where did you get yours?